According to Marpol Annex VI Regulation 14, on or after 1 July 2010 vessels should have written fuel oil change over procedures when using deferent grades of fuel oils before entering or after leaving Emission Control Areas. Until now written fuel oil change over procedures where not mandatory. These written procedures should be available on board before the next periodical Marpol Annex VI survey after 1 July 2010. It is recommended procedures to be available on board after 1 July 2010 in order to avoid Port State Control deficiencies in the event of an inspection. 0.10% m/m on and after 1 January 2015. MEPC.176(58) circular with all amendments of Marpol Annex VI can be downloaded. Fuel sulphur content During change-over, high-sulphur fuel is mixed with low-sulphur fuel. The time needed for the change-over is calculated on the basis of a complete linear blend. This calculation is done using our Low Sulphur Fuel Oil Change-over Calculator, included in the Plan. Fuel consumption Higher fuel consumption means a shorter change-over period. Fuel consumption is a function of ship speed, loading level and auxiliary power requirements. Fuel tank arrangement The configuration of fuel tanks also affects the duration of the change-over. A fuel tank arrangement which consists of one settling tank and one service tank will take longer to flush than one which consists of two settling and two service tanks. For ships with separate low and high-sulphur fuel tanks, the change-over period will be very short. Depending on the ship this procedure may take perhaps 15 hours in case the service tank is filled to 50 % before taken into use. This is an abstract from Wartsila low sulfur change over guidelines manual. The complete document can be downloaded in this link. 3. Move your pen upwards until you intersect the colored lines that best describe the % sulfur content of your low sulfur fuel. The following text has been pasted from DNV guidelines. The optimal fuel oil (FO) system for switching to LSFO is to have double service and double settling tanks, which allows LSFO to be completely segregated from HSFO from the storage to the service tank. Blending will only takes place in the piping between the service tanks and the inlet to the engine. 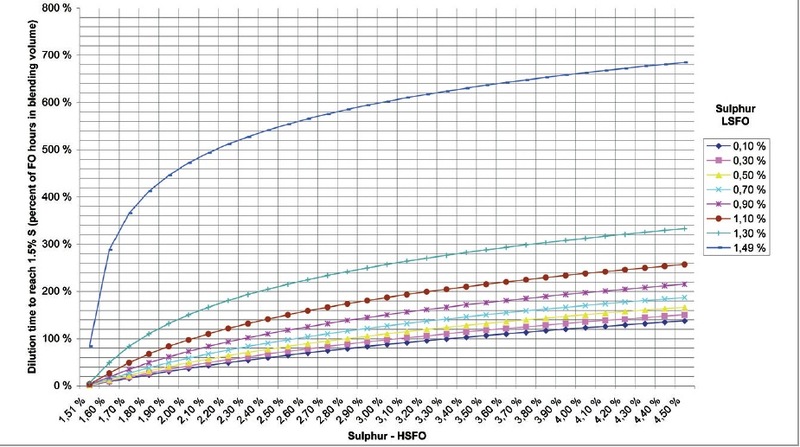 If the FO system contains two service tanks and two settling tanks, and the blending volume contains fuel oil for 15 minutes of operation, the dilution time according to the graph below is 240%*15 minutes = 36 minutes when switching from HSFO with 2.8% S (world average) to LSFO with 1.3% S.
tank, the changeover time will be substantially longer. The first point of blending is the settling tank and the blending volume will comprise of the settling tank, service tank and connected piping. If the settling tank and service tank each contain FO for 12 hours of operation, and we assume one hour of FO in the piping, the dilution time is 240%*25h=60h. It should be emphasised that this plot is a theoretical approximation with a built in safety factor, but without necessarily taking all operational procedures on board into consideration no guaranty can be given. Finally you can download Low Sulfur change over calculator produced by LR, in this link.